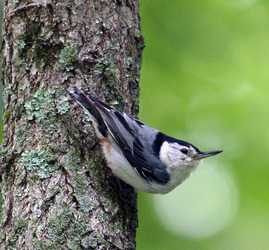 The White-Breasted Nuthatch (Sitta carolinensis) is 5 to 6 inches long. It has a black cap and nape that extends around to the sides of the neck. It has blue-gray upperparts, white upperparts with a rusty wash on the flanks and lower belly. It has a white face and breast, and a long black bill that is slightly upturned at the tip. It has blackish-blue wings with white edging, and white patches on the tail. This is the largest of the North American Nuthatches. It walks upside down on tree trunks, often going round and round as it spirals down the trunks. It is often looking for insects that other birds, who walk upright along tree trunks, miss. The call is a coarse yank, yank, yank that is often referred to like the sound of someone trying to crank a car that has a dead battery. 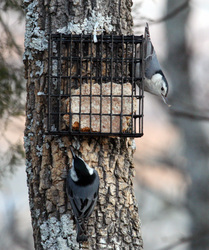 White-Breasted Nuthatches come to feeders for suet and seeds. They eat a variety of nuts, seeds, and insects. The are considered common in deciduous forests and in mixed coniferous-deciduous forests in the North and West. It is vulnerable to habitat loss due to logging. For more information and a range map, click here. 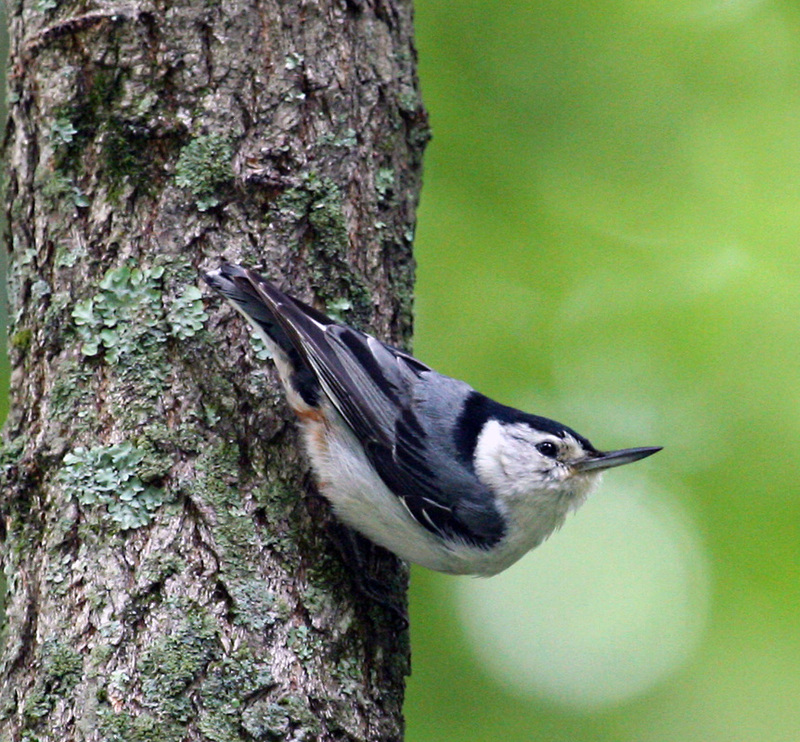 To hear the White-Breasted Nuthatch, click on the player below.